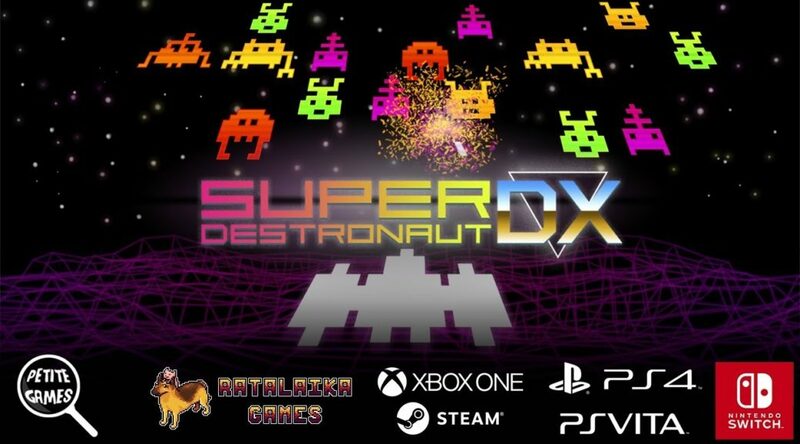 Ratalaika Games and Petite Games have announced Super Destronaut DX, a retro space shooter with a new HD skin and game modes. Super Destronaut DX will be available on Nintendo Switch from July 13, 2018 for USD/EUR4.99 at Nintendo eShop. Details and reveal trailer below..
Once upon a time, arcade shooter gamers where you have to fend off impending waves of an alien menace, was all the rage, but while retro may be old, it is never forgotten. So, inspired by an arcade classic, Super Destronaut DX is retro space shooter that pits you against an enemy more dreaded than a UFO, a scoreboard. With multiple modes and high-scores that can be attained by yourself and players all over the globe, this is one game that will put you on the path of achieving as high a score as you can possibly muster. So, if you are a fan of old-school shooters, be prepared to feel right at home and if you have a friend who is just as passionate as you are about shooting, why not give them a remote and have them play with you. With support for a local multiplayer mode, maybe the two of you together have just what it takes to beat the invading aliens once and for all and secure the top spot! You know you want too.